Whoever builds a for Allah’s (sake) a masjid, Allah builds for him a house in Paradise. All praise is for Allah alone the Lord of all creation. We have been established here in Manchester as a masjid for over thirteen years. As time has gone by the call to the Salafiyyah has expanded here and masha’Allah we now have a very busy masjid. This includes Rent, Rates, Gas & Electric Bills Rent & Wages. Alhamdulilah, we are not funded by any organisation or any body, so we require the help of the salafi community to sustain the masjid and dawa. Currently we run a shortfall of approximately £800 per month, every month. We need as much help as possible in bridging this gap. Setup a regular standing order using Online or Telephone Banking. Even £5.00 per month would help in the regular running costs. You can use the details above to make a one off donation via online banking as well. Or you can make a Paypal donation simply by clicking the button below. 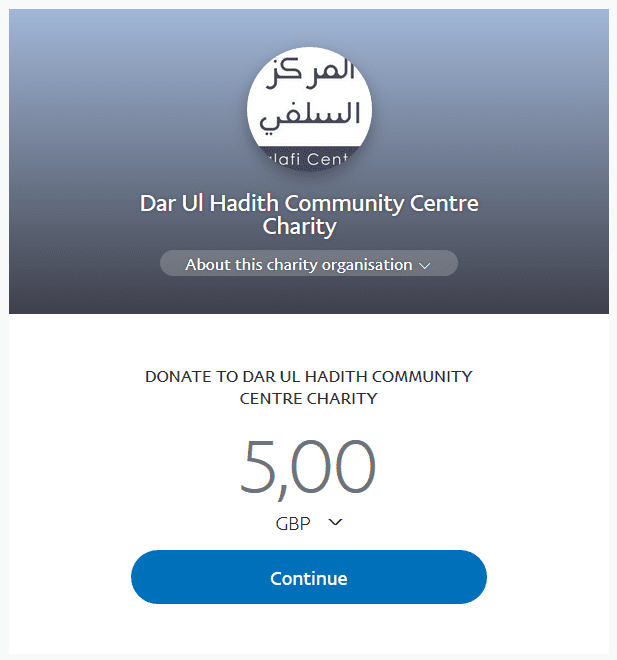 Click below and setting up a regular monthly donation via Paypal, for the sake of Allah of either £5, £10 or £20.